WHY: It’s the latest version of vitamin and mineral packets devoted to support your immune system and also upping your energy. 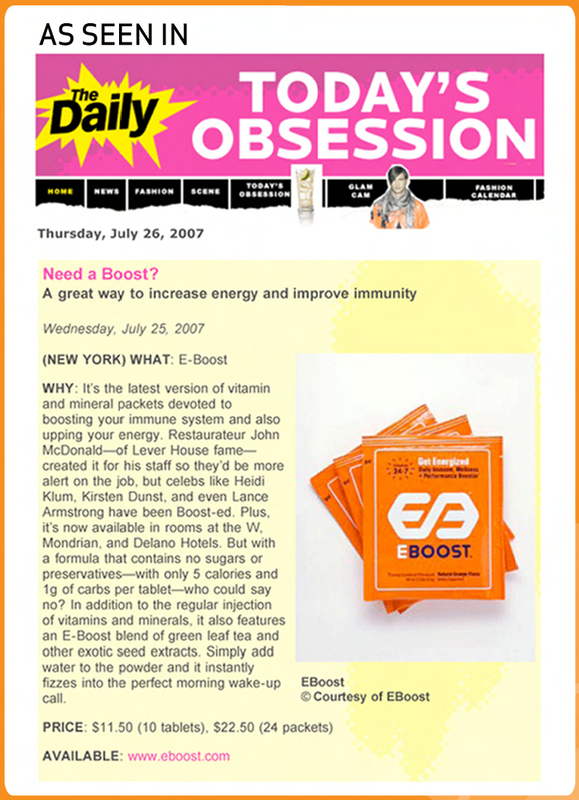 Restauranteur John McDonald–of Lever House fame–created it for his staff so they’d be more alert on the job, but celebs like Heidi Klum, Kirsten Dunst and even Lance Armstrong have been BOOST-ed. Plus, it’s now available in rooms at the W, Mondrian, and Delano Hotels. But with a formula that contains no sugars or preservatives–with only 5 calories and 1g of carbs per tablet–who could say no? In addition to the regular injection of vitamins and minerals, it also features an EBOOST blend of green leaf tea and other exotic seed extracts. Simply add water to the powder and it instantly fizzes into the perfect morning wake-up call. From Times Union: EBOOST as Aphrodesiac?